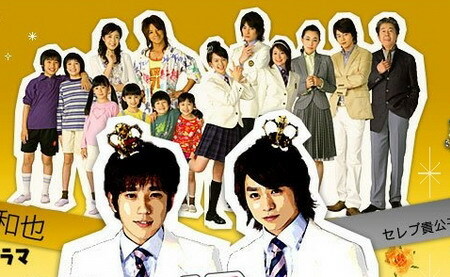 I’ve just finished this Japanese drama starring two of the Arashi members – Nino and Sho. Hmmm.. actually, it’s been in my to-be-watched pile for a long time now, but I haven’t gotten around to watching it. It’s not that the premise doesn’t sound interesting but somehow, I didn’t want to watch it coz it means after that, no more new arashi for me to watch. Hehehe.. yeah.. skewed logic. We’ll.. I love it! It’s a super feel good movie that has lots of heart. It’s a comedy that somehow brings tears to your eyes at the end of every episode. It’s neither tears of sadness nor laughter. It’ s just so touching that you’d end up with moist eyes after each eppie. Plot summary: The story is about the life of Yamada Taro. He’s a scholarship student in one private high school. He’s intelligent, nice and good-looking. He seems perfect and is a heartthrob in his school but none of his follower knows that he’s actually extremely poor. You’d think that when watching Yamada take part-time works, not eat, do housework, etc, you’d hate his family for putting his through hardships. But no, his little brothers and sisters are just as adorable. They know how much effort their big brother is doing and they love him just as much as he loves them. They are like the non-irritating Brady Bunch family. - I love that their family have their own commandments they live by. No borrowing of money, ‘coz they can’t pay it back (hee..) I’d have to get that list sometime. It’s something we all should follow. - Yamada, though very poor doesn’t seem to feel anything lacking in his life. As long as his family is happy, that is enough. - He’s not ashamed of being poor. Typical drama is at school, they pretend to be rich and so on. For Yamada, everybody just assumed that he is rich. And when he’s situation is about to get exposed, his close friend correctly deduced that Yamada really wouldn’t mind. He doesn’t even know he has a secret. - I also like that there are no evil plots or bad guys in this story. I guess his daily life is complicated enough and adding villains on top of that would have been an overkill for the story. - Although his mother is incompetent and his father is a useless bum, I couldn’t really bring myself hate them. I don’t know, don’t want to over-analyze. - The friendship between Taro and Mimura Takuya is something to love as well.